﻿ Streamline Nonprofit Operations with Tech Tools and Data » Red Mango Marketing! “Time is money” is true. The hours in the day that your team can devote to doing the work of delivering your mission should be valued as your most precious commodity. Everything you do during the workday comes at the expense of doing something else, and successful organizations align the time and the effort they spend on the things that generate the greatest return on their time. As a nonprofit, you can maximize your efficiency by using tech tools that produce actionable data to guide decisions about where you should be spending your time. Automated workflows and integrated systems make just about everything easier. When you have fewer steps needed to transfer data between systems, and you spend less time on repetitive tasks, you have more time to focus on your mission and your operations. For example, if you have a connection between your online donation forms and your donor management CRM system, your online gifts can be processed and imported directly into your donor database. With automated software solutions, you take things a step further by sending personalized, dynamic thank you emails, or alerts to your team when a larger-than-normal donation comes through. By allowing data to flow between your systems, you effortlessly empower yourself and your team to work more efficiently. Top priorities can be defined by the data that supports them, not guesses or whims. Best of all, your time can be reserved for those priorities because smaller tasks will be handled for you. Technology can offer you a comprehensive picture of your constituents based on all of your interactions with them, both individually and collectively. This “360-degree view” of your constituents is what can help you play just the right card at just the right time. Start by aggregating all of the data you have about your supporters, members, volunteers, donors, and prospects into a single system. Then add even more data from third party sources, like data research services, social platforms, direct mail providers, and more. This type of data makes your job easier because you will be able to learn what attributes your supporters have in common, who they are as people, and what types of messaging motivates them to support your mission. Use a template-based website builder, an email marketing platform like Constant Contact, and social media platforms to share your stories, your work, your impact, and your team working to make a difference. Tip: Short on staff and budget? Contact local colleges and post on social media looking for volunteer art students who need portfolio examples. Trained designers can help your organization look like a million bucks with a clever photo filter or a new layout for your website. Managing merchant account statements and fees from multiple providers can be confusing and difficult. To gain maximum efficiency, you want to work with a single provider that can accommodate all of the ways you receive payments: checks in the mail, online donations on your website, tickets to events, merchandise in your shop, or services delivered by your organization. Your merchant services provider and technology integrations can help you simplify how your funds are being processed. The more automation you can build into your donation processing workflow with solutions like check scanning, automatic monthly giving, and mobile card scanning, the easier and faster it will be to record, manage, and allocate your funds to the aspects of your program that need them the most. By using tech tools and data to help optimize your processes, you will be able to spend your time where it is needed most. We live in a time where information and technology are at our fingertips. Take advantage of the technology and data available to your nonprofit, and build out your plan for success today. 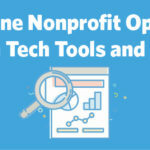 The post Streamline Nonprofit Operations with Tech Tools and Data appeared first on Constant Contact Blogs. This entry was posted on Friday, September 28th, 2018 at 8:00 am	and is filed under Fresh Insights, News & Updates, Nonprofit. You can follow any responses to this entry through the RSS 2.0 feed. Both comments and pings are currently closed.